We’ve got your ventilation needs covered here at G&R Electrical Wholesalers. Whether it’s a commercial or industrial project, we can provide full design services, either on-site or from plans, for any size job. Thanks to our huge stock holding of electrical ventilation equipment and parts, we’re able to deliver energy conscious installations on time and on budget, designed to your specifications. Our specialist, local team will find the right installer dependant entirely on the scope of your project – and we’re only satisfied when you are. If you’d like to learn more about our ventilation services or stock, please get in touch with us today and we’d be happy to help. G&R Electrical Wholesalers are committed towards the design and development of ventilation installation services for various industrial applications. We provide the ventilation systems Plymouth requires for its homes and businesses by combining experience, expertise and quality equipment, resulting in unparalleled quality and customer satisfaction. Our processes comply with the highest quality and safety standards and with our vast industry knowledge and expertise, we are able to offer industrial solutions that include air conditioning systems, ventilation systems, air coolers, and economic ventilators. Our technical experience makes our product range perform with the maximum efficiency to save power, delivering the ventilation systems Plymouth, Redruth and the South West region can be confident installing. G&R Electrical Wholesalers has many product solutions to help increase airflow domestic, commercial or industrial buildings. Energy efficient homes and offices in Plymouth, Redruth and the South West need mechanical ventilation installation to maintain air quality in many cases, with proper ventilation mandatory in many industries. You can choose partial or complete ventilation systems Plymouth can trust depending largely on your budget. With our superior ventilation services you’ll be assured fresh, cool air at all times. Our smart systems maintain and modulate humidity and temperature of incoming air to match requirements, and they are also easy to clean, requiring minimum maintenance. If required, our professional installation team can cover Devon, Cornwall and further afield in the South West on request, so if you are looking for the best ventilation services Plymouth has to offer, you can completely rely on G&R Electrical Wholesalers. 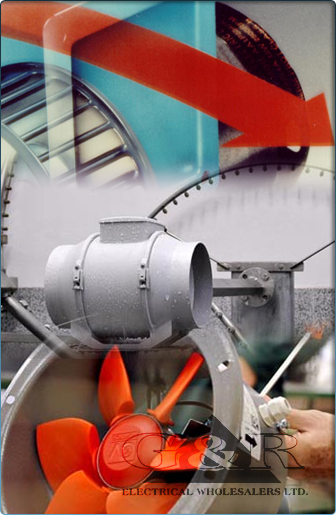 Our vent fans are powerful, strong and can be customised according to your needs. Drawing fresh air from various sources and making it circulate throughout your property, you’ll soon find that with proper air circulation you’ll see increased energy savings and a happier workforce, especially in an industrial setting. These simple reasons are why our Plymouth ventilation services have become famous among eco-conscious customers and sensible business owners alike. Whether you are a business owner or an electrical contractor looking for some assistance on a ventilation project, we guarantee to understand your needs perfectly, offering a complete ventilation service for all areas in Devon and Cornwall. Contact us today for further information, a one-to-one chat, or a no obligation quote – we’ll be happy to assist you.